A review in 10 words (or thereabouts): The Boxer Rebellion through the eyes of a young warrior and saint. Boxer: China, 1898. Bands of foreign missionaries and soldiers roam the countryside, bullying and robbing Chinese peasants. Saints: China, 1898. An unwanted and unwelcome fourth daughter, Four-Girl isn't even given a proper name by her family when she's born. She finds friendship--and a name, Vibiana--in the most unlikely of places: Christianity. 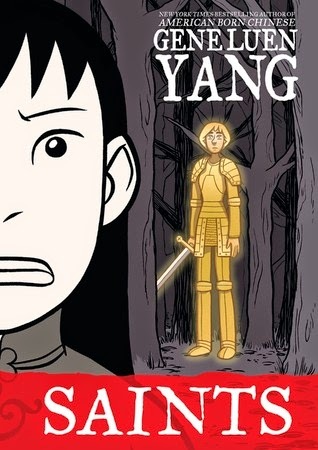 I've been a fan of Gene Luen Yang for quite some time. I was first introduced to his style of storytelling in American Born Chinese. He introduces the reader to Chinese culture in an accessible way, telling history through beautiful artwork and folklore. In Boxer, we see the rise of western religion in rural China with the introduction of missionaries into the countryside and the inevitable backlash from local resistance. Then we also get to see the flip side, in Saints. A young girl, a convert, is looking for a way to belong in late 19th century China, and she finds it with the ghost of a saint and the acceptance of a foreign faith. 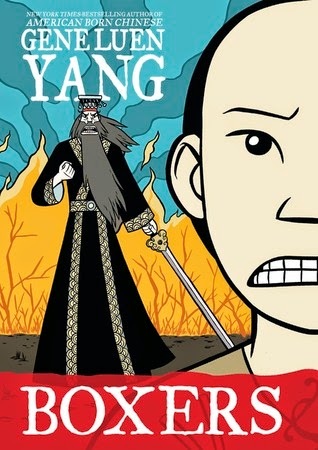 I'm usually not a fan of historical fiction, but Gene Luen Yang manages to make it thrilling and engaging. I know very little of Chinese history, but I might just have to read a little more on the Boxer Rebellion.